This is a guest blog from Helen Miles, research associate, Department of Computer Science at Aberystwyth University. This year’s BCSWomen Lovelace Colloquium was the 8th, and was the biggest in the event’s history. This was my first ever Lovelace Colloquium, and I’m sorry to say it was only as a helper/photographer. I’d never heard of this event as an undergraduate (admittedly, a few years ago now), and I wish so much that I had! What a fantastic day, meeting so many women in tech with such great posters across all kinds of computing topics. The day involved a number things: a poster competition for undergraduates at different stages of their course, keynotes from some very inspirational women in tech, a questions panel, lots of company careers stalls, and (most importantly) cake. One of the things that impressed me most about the whole event was how the wonderful Dr Hannah Dee (main organiser) manages to run the event free for the undergraduates by getting so many great and generous industrial sponsors to cover different things throughout the day. It’s pretty cool to see so many companies being actively interested in getting more women employed in tech careers. The colloquium was headline sponsored by Google (who also gave us some cool goodie bags), with a delicious lunch by Twitter, and coffee and cake by Bloomberg. Additional travel was sponsored by BCS, the University of Edinburgh, and SICSA (speaker travel). There were a lot of employer stalls, including FDM, Kotikan (who made an awesome garden stand! ), UTC Aerospace, VMware, GCHQ, Bloomberg (with a cupcake challenge! ), Twitter, Scott Logic, EMC and JP Morgan. I have to say a huge thank you to Amy Guy for being the local organiser, for putting so much work into this year’s colloquium and for hosting us in the beautiful Informatics Forum at the University of Edinburgh. It’s quite a testament to the colloquium that she attended the event all through her undergrad, and now she is a postgraduate and still doing so much to support it. It was great to have perspectives from women in both academic and industrial roles, and to hear how they got to where they are now. Some wonderful stories and great advice about following what makes you happy and persevering to get to that place, as well as some amazing work from maths games to robotic crickets! An afternoon panel gave attendees the chance to ask questions about careers in tech, from both industrial and academic paths. 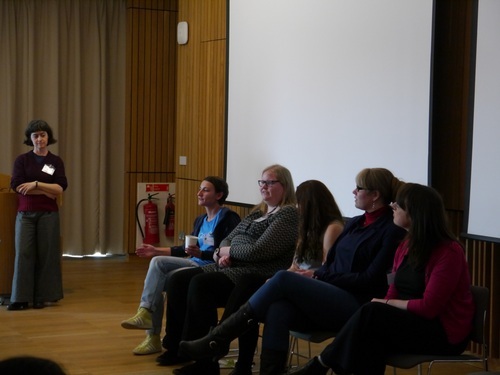 Four panelists were from sponsoring companies – Google, EMC, Bloomberg and JP Morgan – and a fifth from the University of Dundee represented academia. My favourite piece of advice (and I heard so many others say the same thing!) was from Dr Karen Petrie from the University of Dundee: she has a playlist of ‘power songs’ to get her ready for a fight (not an actual fight…). This is what works for her and she recommended we all find the thing that works for us, the thing that gets us ready to deal with hard times and difficult situations. This might be listening to a song, wearing certain clothes or makeup, or even having two pairs of glasses – a friendly pair and an intimidating pair! The panel answering questions about careers in tech and their own experiences. 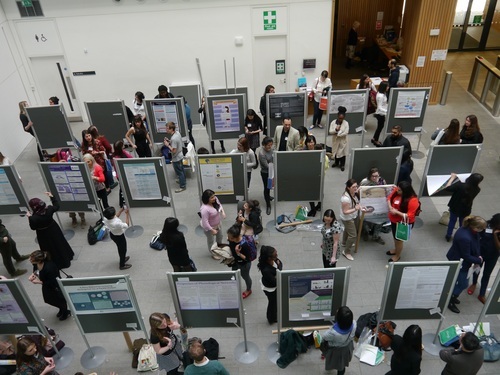 This year’s poster competition drew the largest ever number of entries to the Lovelace Colloquium, with over 70 posters from first year to MSc level. Posters are split into categories based on year of study. Each poster contest has a prize with an industrial sponsor, and the winners also got special Google goodie-bags full of cool swag to go with their prize money! Midway through the day, some of the posters are getting swapped – so many brilliant posters and so few poster boards! This covers undergraduate students in between their first and final years of study, so second year students from a three-year course and third year/industrial placement students from a four-year course. This covers anyone in their final year, so third year students on a three-year course and fourth year students for those on a four-year undergraduate course. The day ended with a social at the lovely Potting Shed bar, just across the road from the Informatics Forum. Scott Logic kindly sponsored the evening’s drinks and nibbles, where everyone spent time mingling, chatting about posters, keynotes, and tech, and just having a great time! So after my first time attending the BCSWomen Lovelace Colloquium, all I can do is say that if you are an undergraduate woman in tech, please go! It can sound scary to go to an event like this on your own, but I can promise you, you aren’t alone. As a postdoc, I’ve been to a few conferences, but Lovelace was the friendliest and most interesting with such a variety of topics; no wonder people keep coming back every year. Such an amazing event - proud to have been a finalist again and soon-to-be-Alumni. Check out Hannah's Storify too.